Bent Gabrielsen Qualified as a goldsmith in 1949 after serving his apprenticeship with the goldsmith Ejler Fangel in Copenhagen. He was among the first group of students at the Goldsmith's Academy from where he graduated with top grades in 1953. He was immediately hired by the Hans Hansen Solvsmedie and worked there until 1969. By the time he left he was responsible for the firm's entire production. 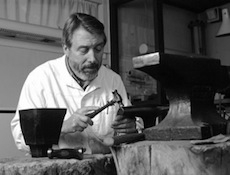 After leaving the Hans Hansen Company, Gabrielsen set up his own workshop called "Gabrielsen's Guldsmedie". He kept his business small with he and his wife the only employees. A large part of his production was sold in Japan. Bent Gabrielsen designed for Georg Jensen and won the Lunning Prize in 1964. As Erik Bohr, Chairman of the Lunning Committee wrote, " Bent Gabrielsen's jewelry carries absolute conviction as to its function; his handling of materials is so restrained and well considered that one feels this could hardly be otherwise. His jewelry is simple and clearly constructed, often with links connecting naturally with each other so that the complete piece makes up a beautiful whole. Every single detail of his things is worked out. There are no false effects. He does not take the easy way out.